A large number of invitations for the application of Canadian permanent residence have been issued by the government of Canada through express entry draw. The selection process for Canadian immigration named as express entry draw that took place on June 25, 2018. Minimum comprehensive ranking system score (CRS) is 442. This implies that the candidates having comprehensive ranking system score (CRS) 442 or above 442 are eligible to apply for Permanent residents of Canada and the candidates having comprehensive ranking system score (CRS) below 442 are clearly not eligible for the application. This is the second express entry draw that took place on June 25, 2018, . First express entry draw was held on June 13, 2018, in which the cut off comprehensive ranking system score was 451. Clearly, in just 11 days the cut off comprehensive ranking system score (CRS) unexpectedly dropped from 451to 442. Immigration, Refugees and citizenship Canada (IRCC) have decided to use its tie-break rule. The tie-break is a procedure in which those candidates whose profiles have been in the pool longer are prioritized for further procedure. The tie-break date and time for this latest invitation round was held on January 28, 2018, at 21:06:11 UTC. This means that all those candidates having comprehensive ranking system score (CRS) 442 or above 442 whose profile have been submitted before the tie-break time and date that is 28, 2018 at 21:06:11 will have received an Invitation to apply (ITA) in this current invitation round. Canada is planning to increase the number of candidates through express entry draw to 74,900 in 2018 and will again increase the number of candidates to 81,400 through the same selection process named express entry draw in 2019 for permanent residence in Canada. Total 39,700 invitations for applications have been issued by Immigration, Refugees and citizenship Canada (IRCC) through express entry draw till now. Praveen and Dev are 27 years old, married and each holds a bachelor’s degree. 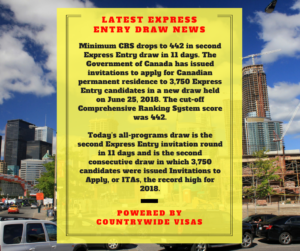 Each has been working as a software engineer for three years and they both have advanced English language proficiencies (CRS) of 443 would have been high enough to obtain an Invitation to apply (ITA) during the June 25 Express Entry Draw.